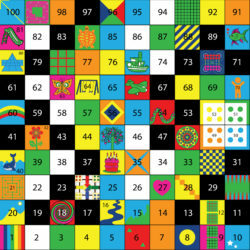 Each square in the KS1 MAGIC SQUARE has specific educational goals in mind ,click on a square for detailed descriptions. 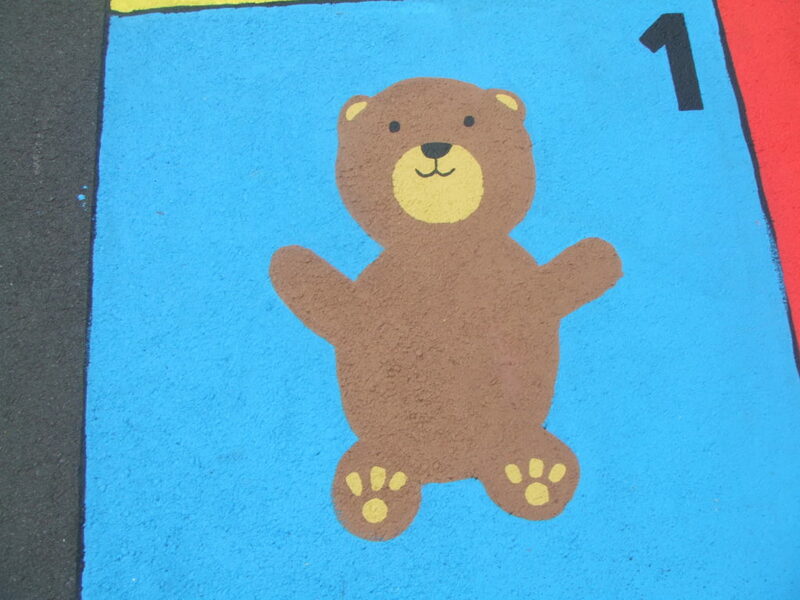 The Teddy Bear can be used to introduce the number 1, most children have Teddy bears so this can be used as an introduction to talk about the names of children’s cuddly toys, other toys and also if the game is used in a race game format 1 can be the start. The odd numbers are painted in black throughout the game. SQUARE 2. THE DANCERS The Dancers can be used to introduce the number 2, to talk about addition 1+1 =2. It can be used to get the children to think of a style of dance and act it out, also gender roles can be looked at and challenged “can girls breakdance, can boys do ballet.” Colours and items of clothing could also be looked at. The even numbers are painted in white throughout the game. 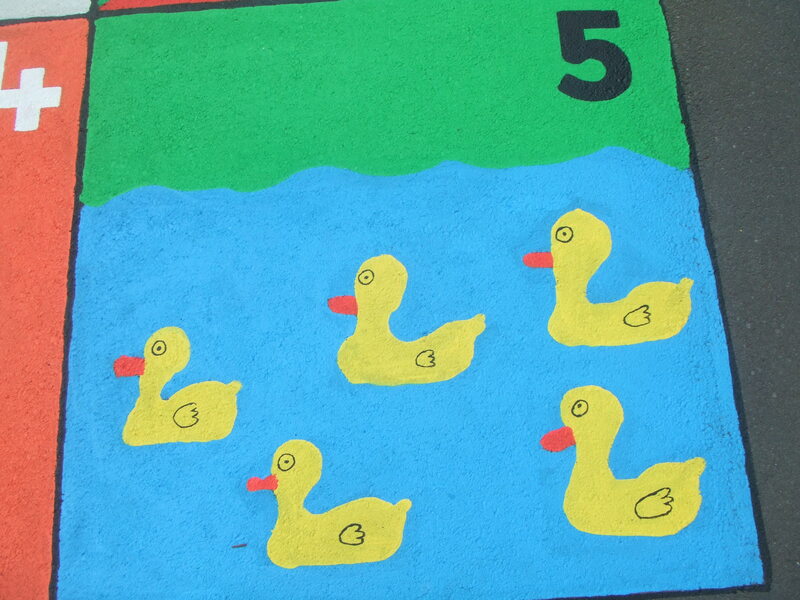 SQUARE 3. THE LITTLE PIGS The Little Pigs can be used for counting up to 3. It can be used as a base to talk about emotions “which pig is sad which pig is happy and why” issue to do with home life and fairy tales in general, it may be helpful to work directly with the story getting the children to huff and puff like the big bad wolf. 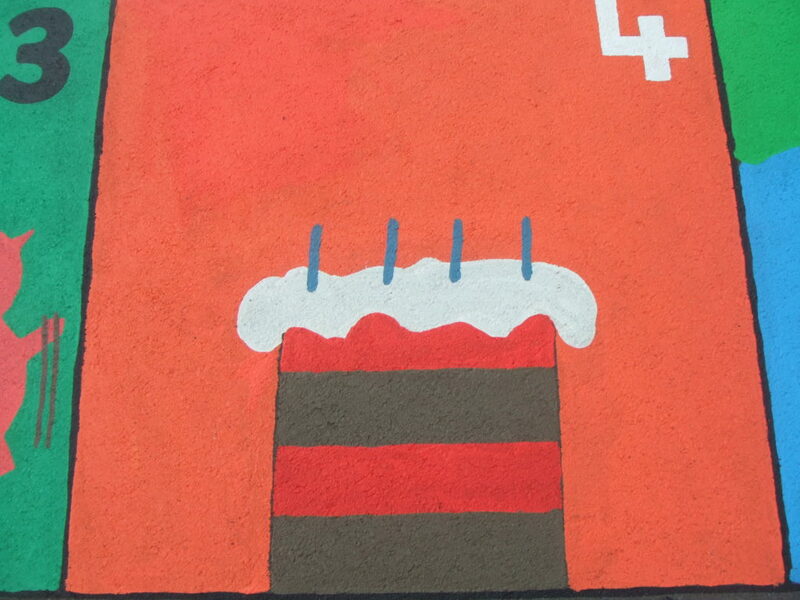 The Birthday Cake can be used for counting the layers of the cake or the candles, looking at the concept of on top of/above and under/below “the candles are on top of the cake “, “the chocolate layer is below the strawberry layer”. Ideas such as age, celebration and food we like could be looked at. 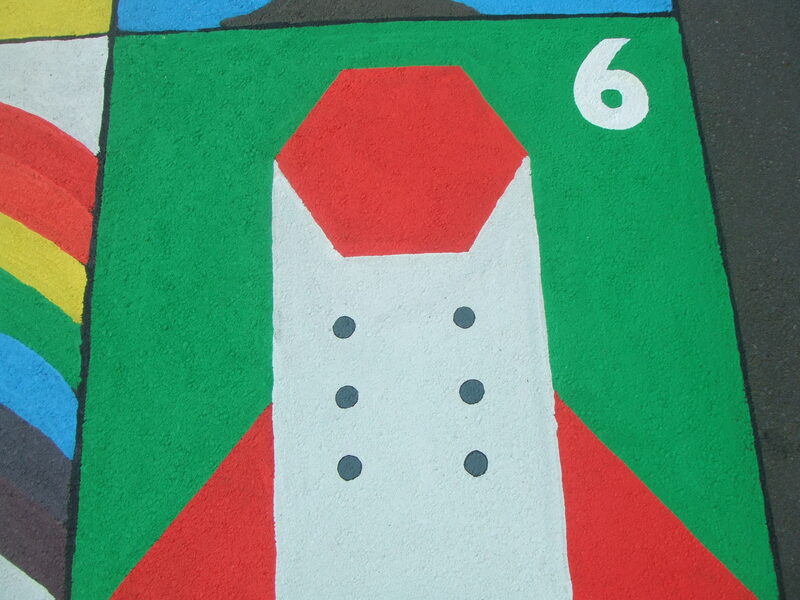 The Rocket is useful in showing shapes (hexagon, triangle and circle) and counting the circles or looking at 2 x 3, from a language perspective the children could be asked to read, write or talk about travel stories. 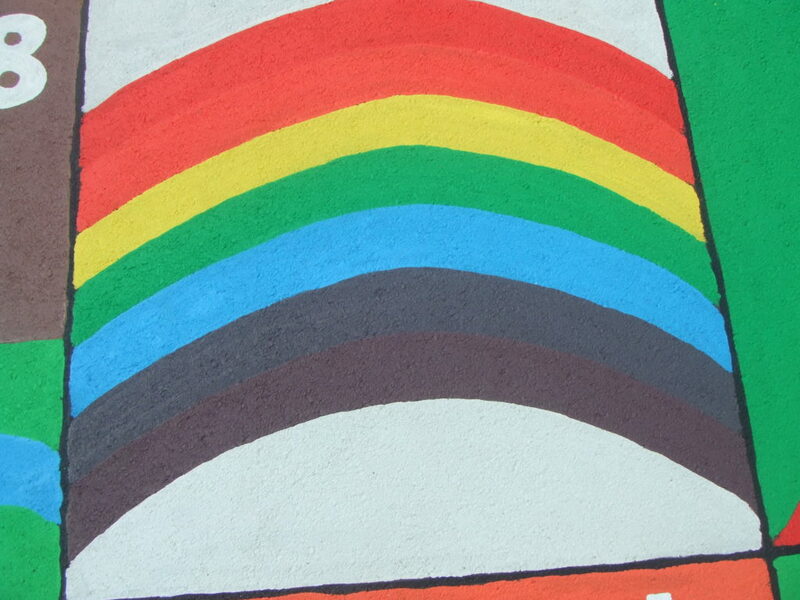 The Rainbow can be used to introduce the colours, counting up to 7. An interesting activity could be get the children to write their own pneumonic. This could be presented showing a famous one such as Richard Of York Gave Battle In Vain which is a representation of the colours of the rainbow Red, Orange, Yellow, Green, Blue, Indigo, Violet. 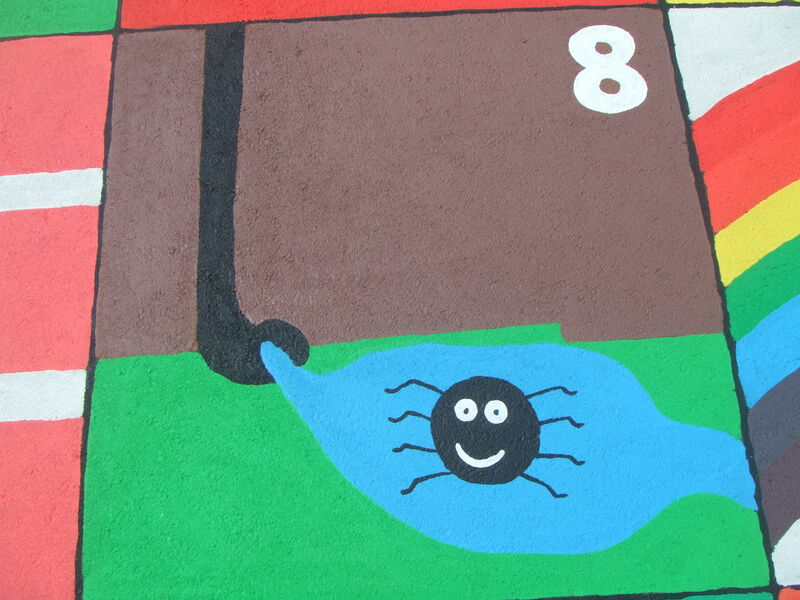 The Incy Wincy Spider square can be used to count the legs, talk about animals and insects, fears. Focussing on the part of the rhyme (which can be found in appendix 1) which shows Incy climbing up the spout again as a way of showing the children the importance of trying and no giving up may be useful. 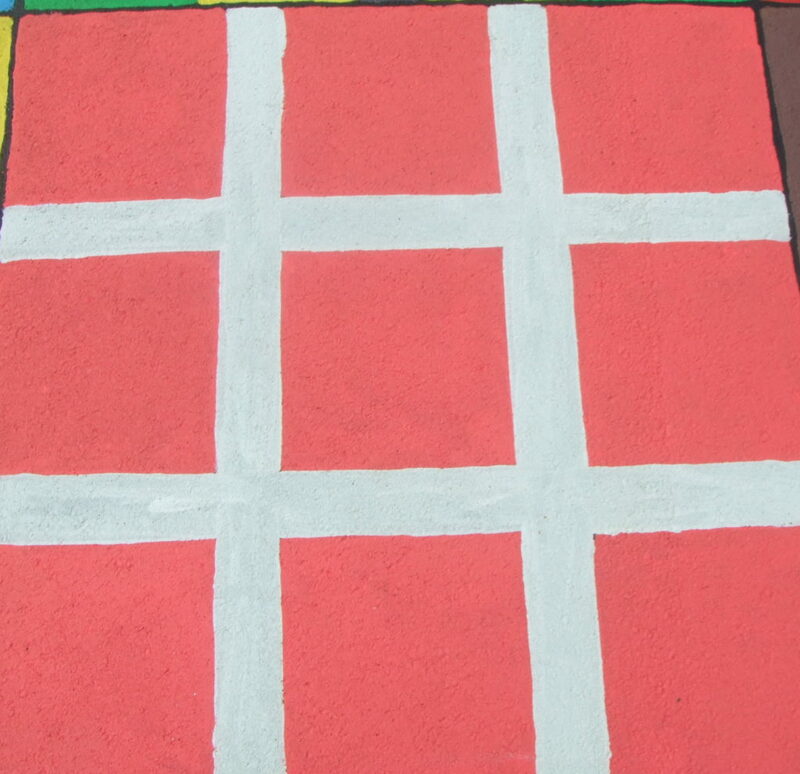 The Noughts and Crosses square (Tic Tac Toe) like the number 7 doesn’t have its number painted on to encourage the children to complete the sequencing (number painting is optional) It can be used for counting squares and looking at lineal relationships. Games such as Tic Tac Toe and Seega (traditional Egyptian game see (appendix 2) can be played and if number cards 1 to 9 and maths symbols + - = etc. are available a variety of maths games can be played. 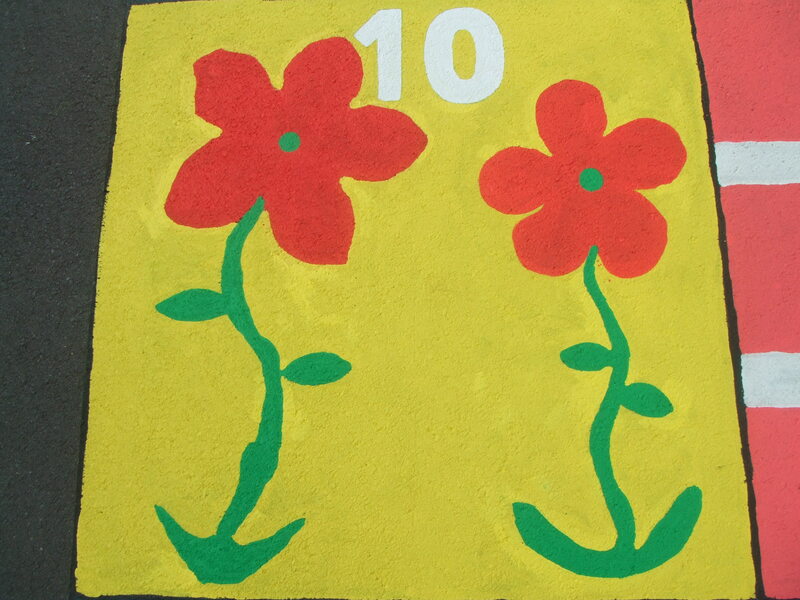 The two flowers have 5 petals each so these can be used to practice counting and to show that 2 x 5 = 10. 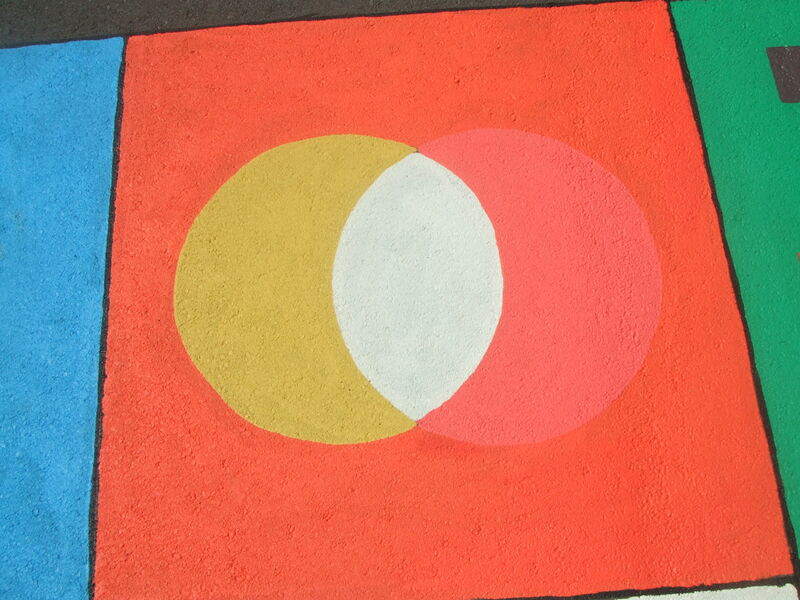 This square can also highlight topics such as nature, biology, (bee polonization) and the different interpretation of colours and flowers (language of flowers). 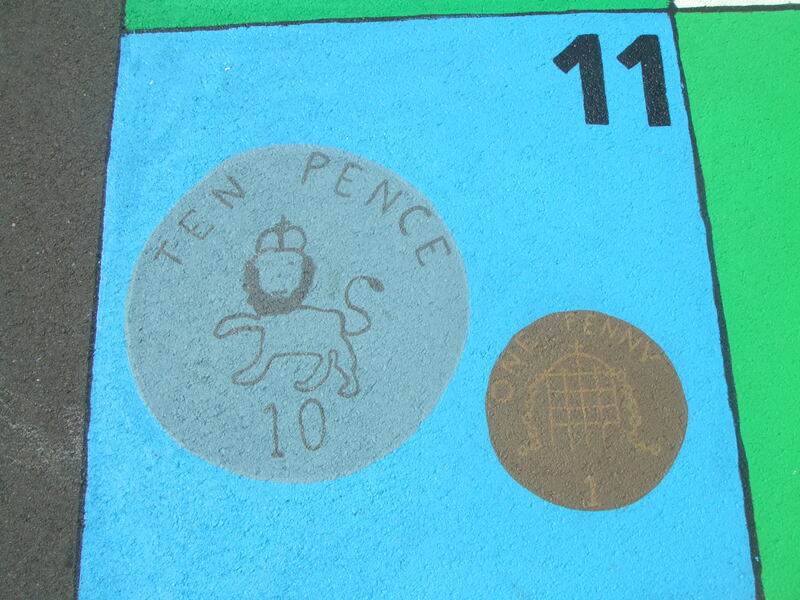 The Money square shows clearly the introduction of the concept of tens and units and place value as well as what change is required for a certain purchase. It can also be used to look at how we use money in shopping, what things we can buy from different places e.g. markets, town centre, newsagent. 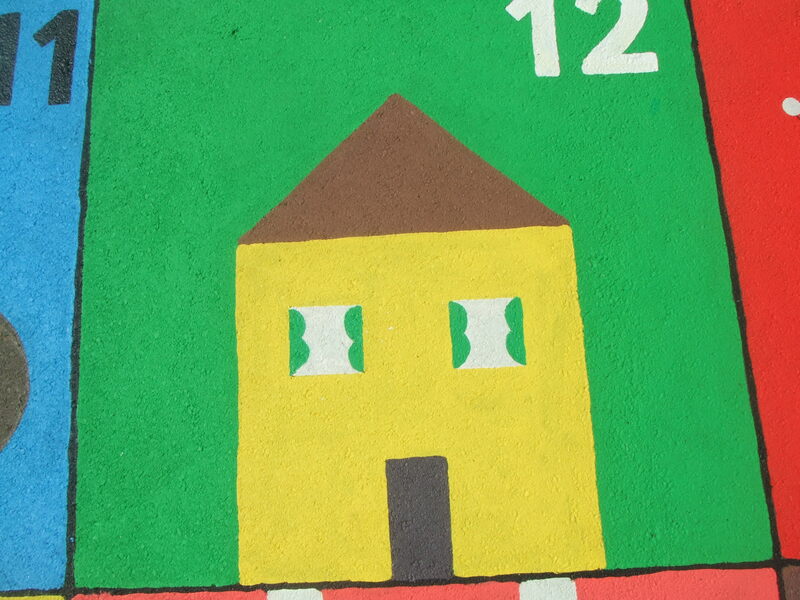 The house shows either 1 door and 2 windows or 1 house and 2 windows for showing tens and units. Ideas of above and below “the windows are above the door and below the roof”. Topics for discussion could include types of houses, animal houses and neighbors. 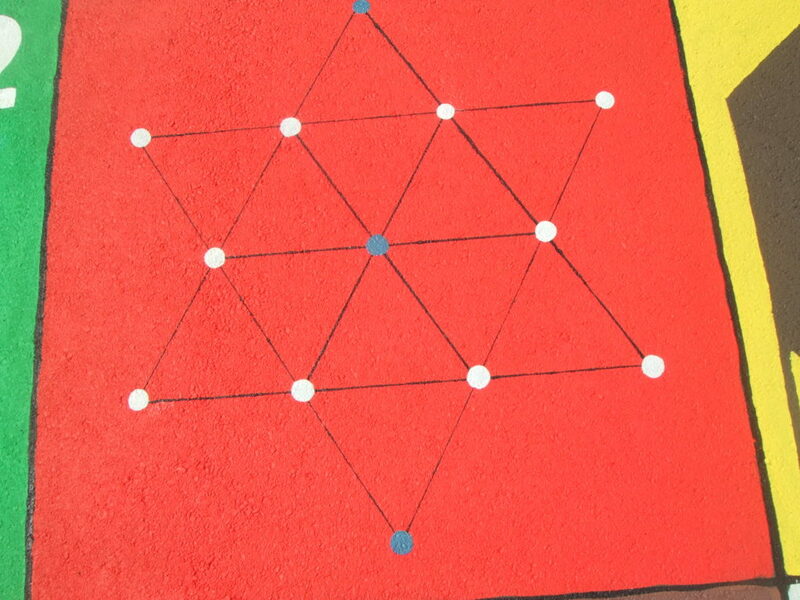 The Hexagram square can be used to show triangles, hexagons and a 6-pointed star, look at lineal relationships and play maths games such as deadly red and four in a row. There are 10 white dots and 3 blue dots for showing tens and units and counting and the number 13 is missing for sequencing exercises. 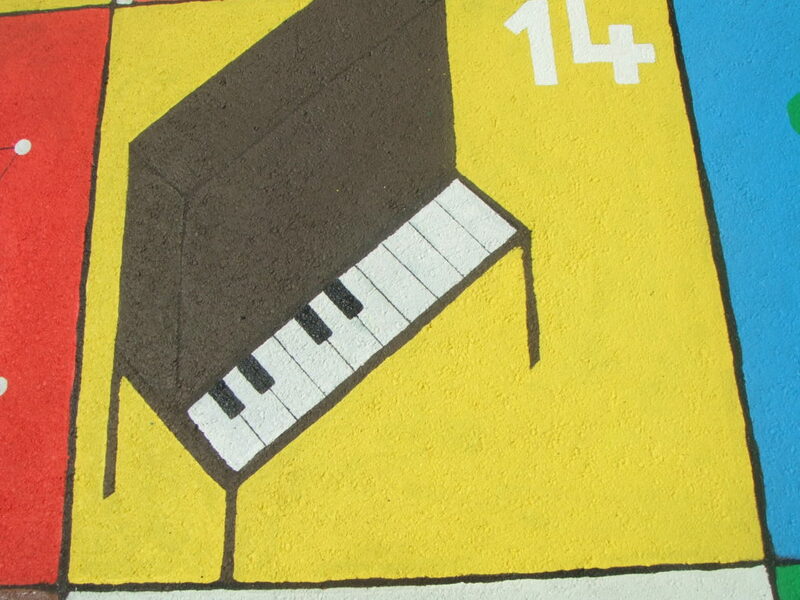 The Piano has 10 white keys and 4 black keys again to reinforce the concepts of place value, tens and units. Discussion topic may include sounds /music we like, notes, rhythm, instruments and syllables. Games like singing a song about our names or doing a dance could be used. 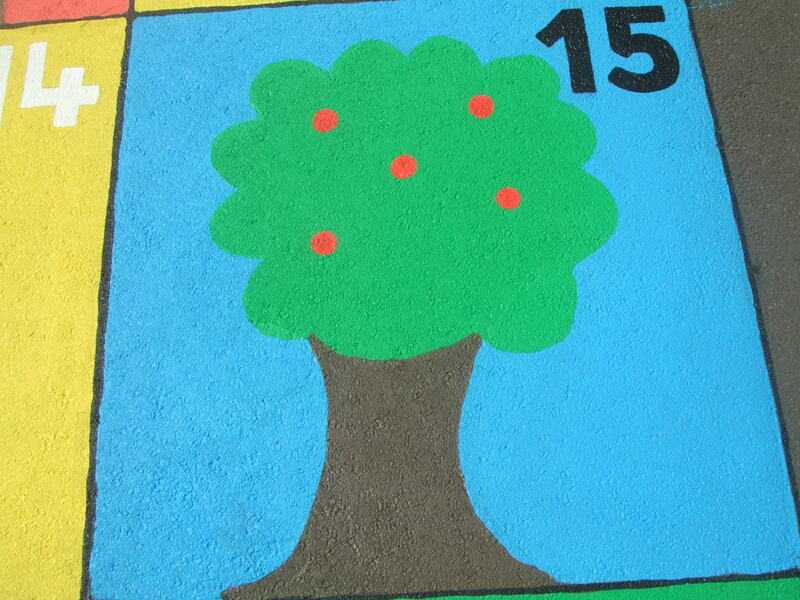 The Apple Tree has 1 tree and 5 apples for the tens and units theme. Games such as naming fruit beginning with a certain letter and discussion topics like gravity and nature could be looked at. 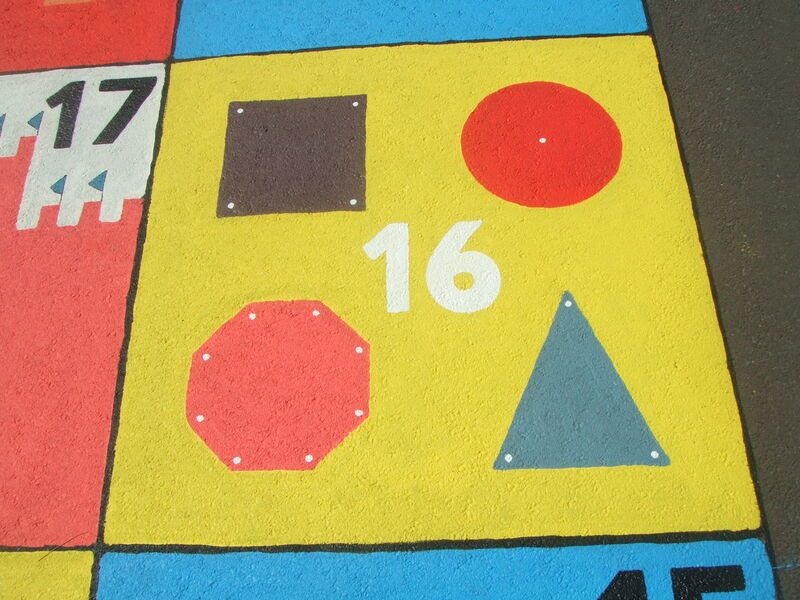 The Shapes square looks specifically at the square the octagon the triangle and the circle with the dots corresponding to the number of sides and can be counted with the children. 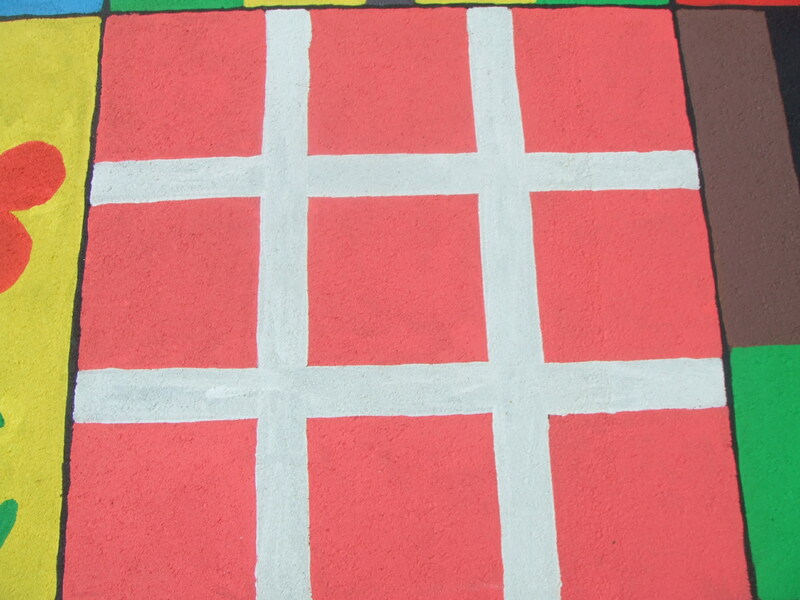 Games such as stand on the pink octagon or place your right hand on the red circle and your left foot on the silver triangle may help dexterity, coordination, colour and shape recognition. 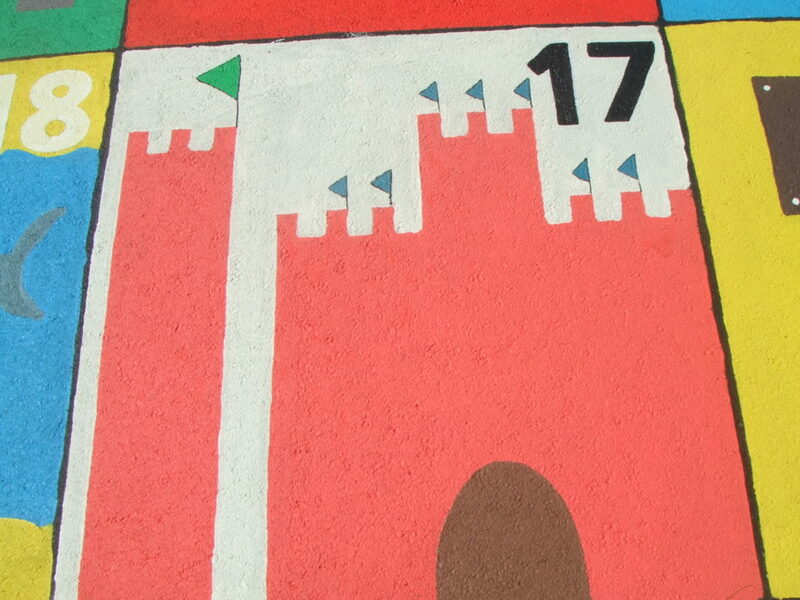 The Castle has 1 tower with a green flag and the main castle has 7 blue flags representing 10 and 7. Discussion topics could include history of castles who lives in them, functions of the drawbridge and moat, flags and the Union Jack. 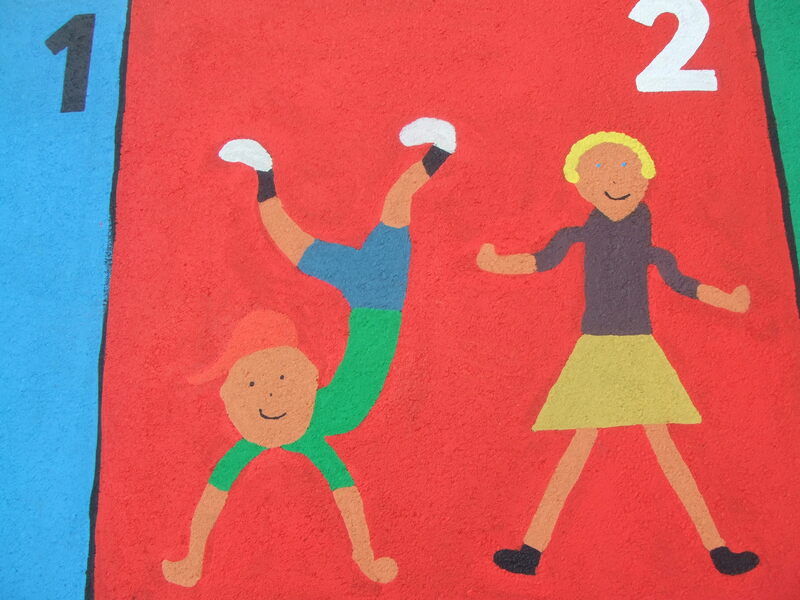 Having the children design their own flag may be an enjoyable activity. 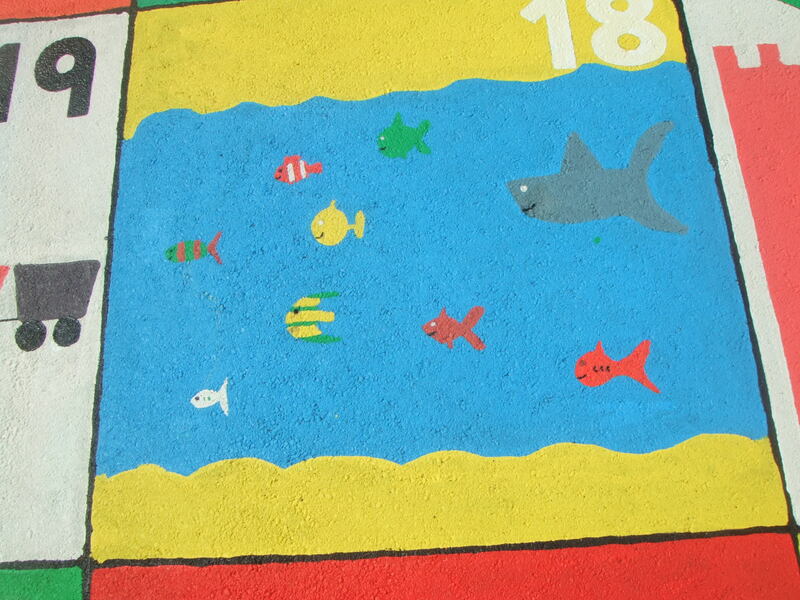 The Fishes shows 1 large grey shark and 8 small colourful fishes, to represent 10 and 8, size comparison and colour recognition can also be looked at. Discussion topics such as the environment and different sea animals may be productive. 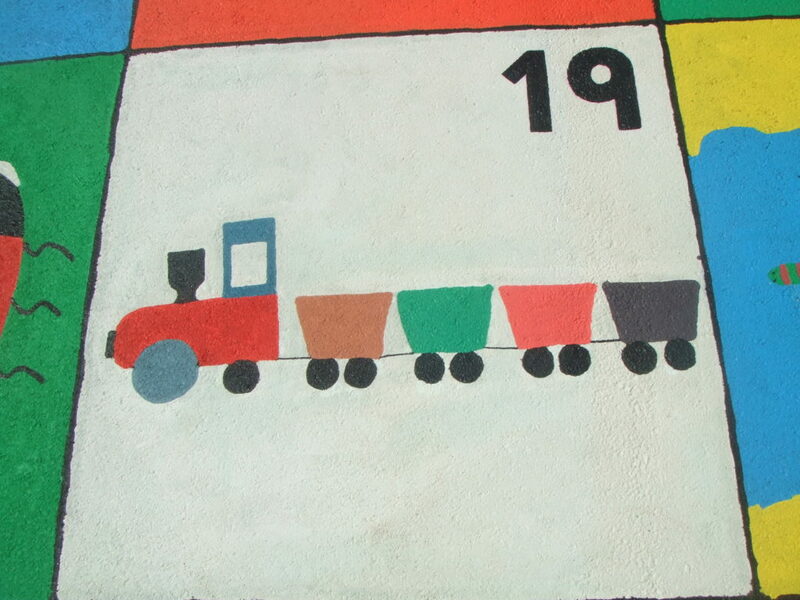 The Train has 1 large grey wheel and 9 small black wheels so can be used like square 18. Ideas such as different types of transport and travel in general could be looked at. 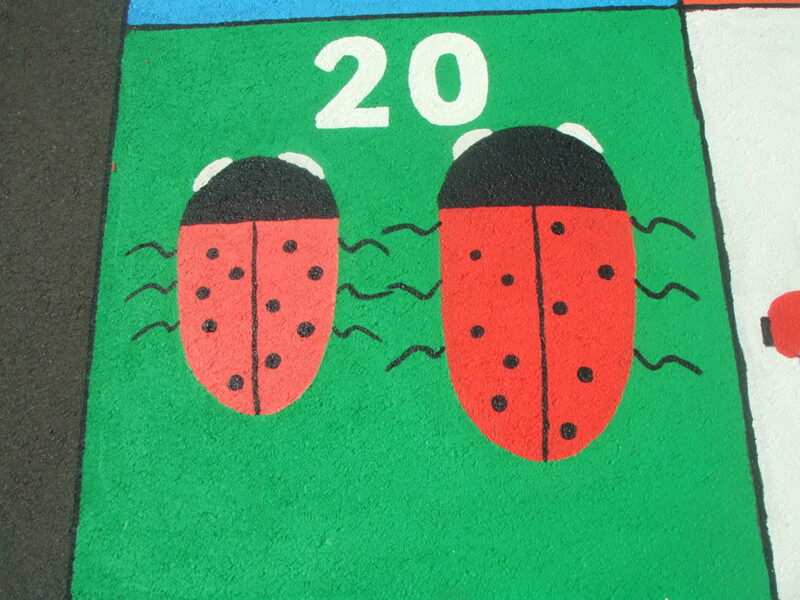 The 2 ladybirds each have 10 spots, 5 on each side of their bodies so the ideas of 5 x 2 = 10, 4 x 5 = 20 and 2 x 10 = 20 may be examined. Size and colour comparison is also possible. Gender issues may be looked at “which ladybird is a boy, why do you think that” and topics such as evolution and camouflage in animals e.g. Tigers and zebras may prove interesting. 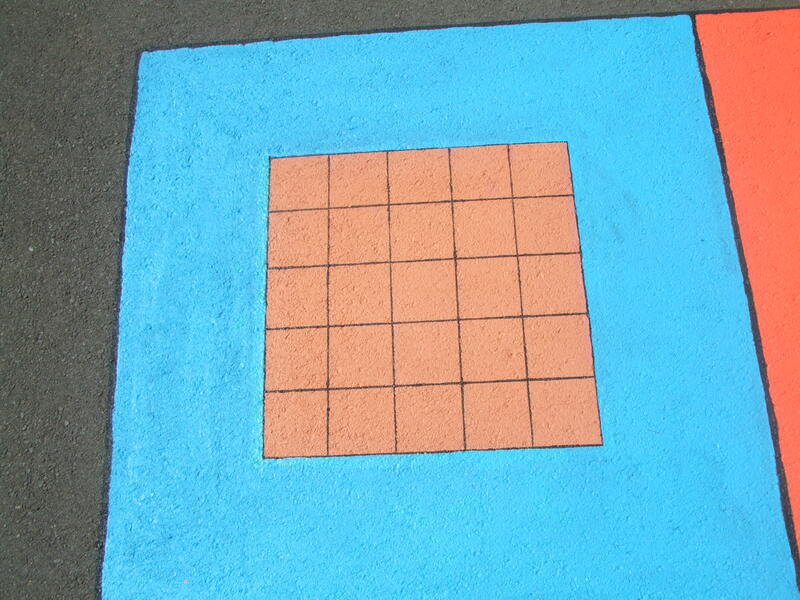 The grid in this square is exactly 1/10 of the size of the whole Magic Square, each square measures 10cm and the whole grid being 50cm so can be used with rulers to demonstrate scale and measurement. The 5 x table can also be introduced here looking at numbers of squares per line or column. 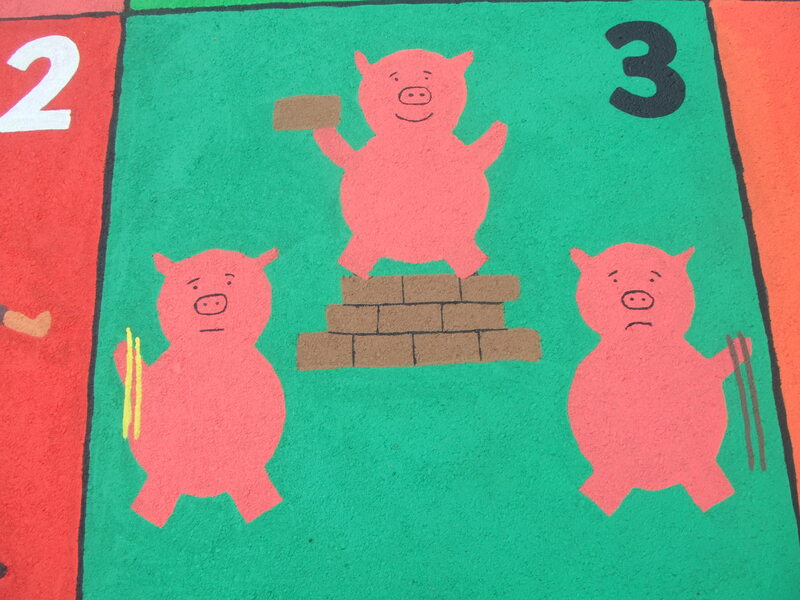 There are also various tradition board games (see appendix 1) playable on this 5 by 5 grid. Numicon is a multi-sensory approach to teaching maths developed by experts in the classroom. It is designed to help children understand connections between numbers. The size of the numicon in this square corresponds directly to the lego type blocks used in some schools. 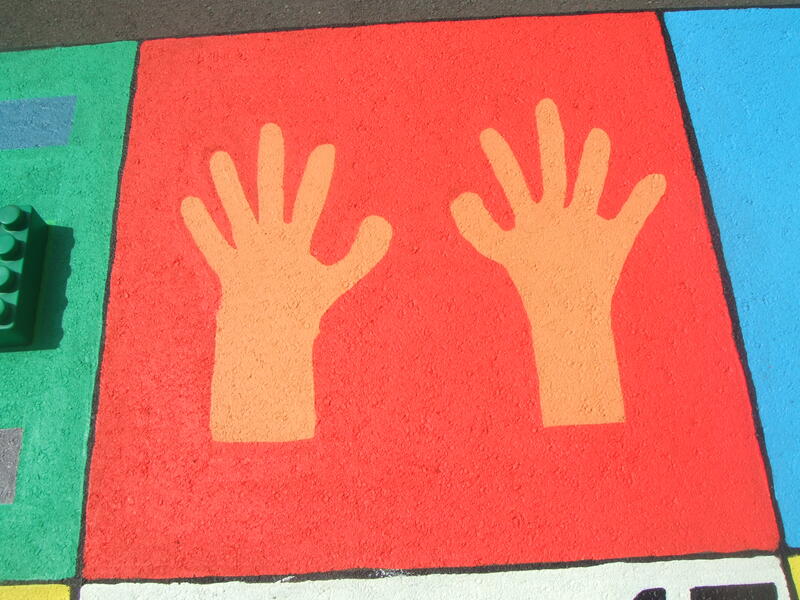 The 2 Hands can be used to show number bonds, counting 1 to 10 and the concept of 2 x 5 = 10. Games such as clapping and clicking fingers may be looked as well as a traditional game called chopsticks. 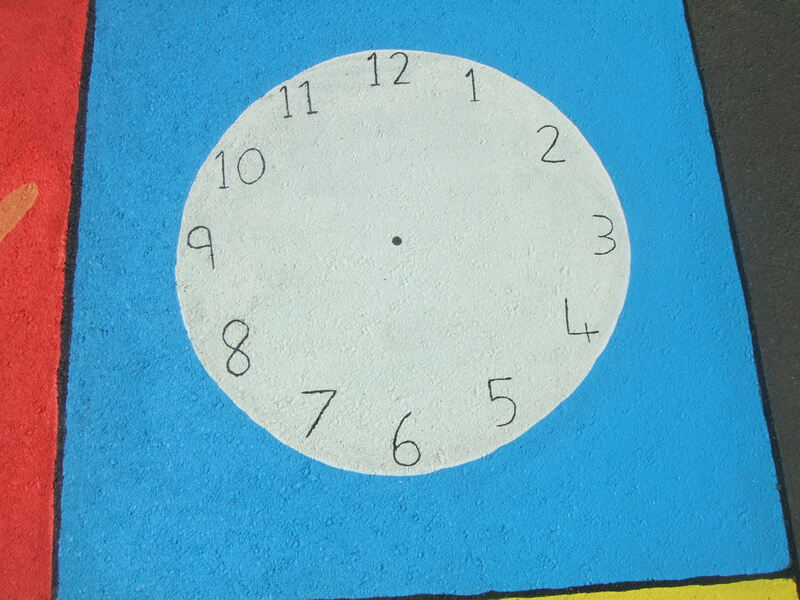 The Clock is used for introducing ideas of measuring time and can be used with human hands or a long and a shorter stick.